Sloppy Joes are fun to eat for kids and adults alike – but be prepared for some spillage! They boast a lot of good “s-words”: simple, satisfying, and savoury yet sweet. Better yet, they are also very nutritious (hooray for fiber, protein, and iron! ), especially when served on a whole wheat bun. 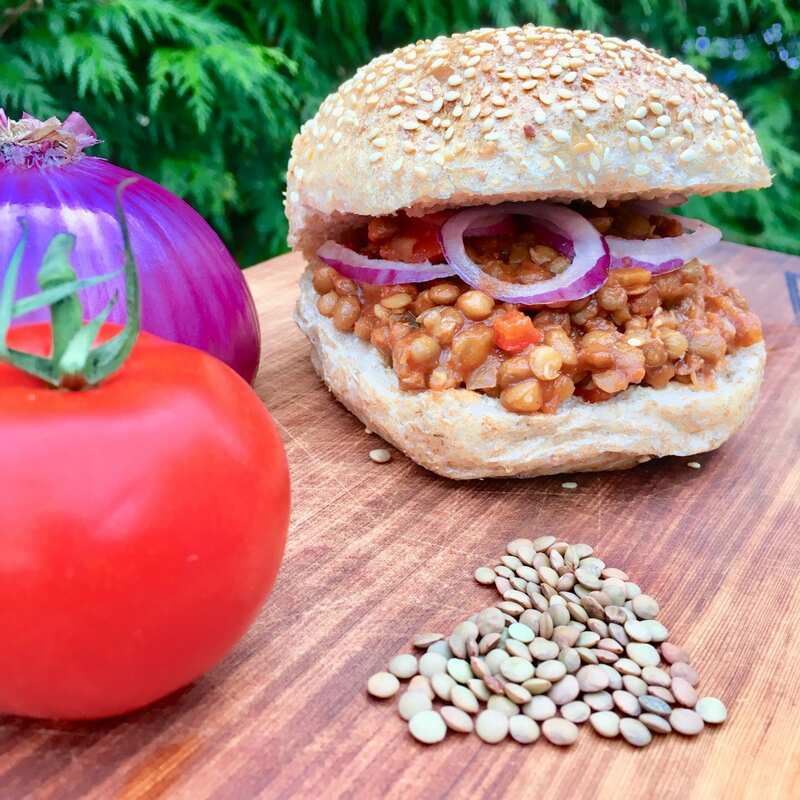 I have fond childhood memories of chowing down on Sloppy Joes, but never thought to serve them to my family until a meatless version literally landed on our doorstep (thank you, Fresh Prep!). The meal kit was a win, and so I quickly created my own “mashup” version, with mouthwatering inspiration from Minimalist Baker and Nora Cooks. Much of the sweetness comes from the tomato paste, but I also use a bit of added sweetener (brown sugar works well, or maple syrup, whatever you prefer). In my books, a BIT of added sugar is welcome if it helps you or your child embrace a generous serving of something super healthy like lentils. Random note: This is one of the rare times I use canned lentils rather than raw, simply because this is what came with the Fresh Prep kit. Making it from dried lentils really only adds a few minutes. Plan for 4-6 buns depending how high you pile the filling! 1. Mince the onion, bell pepper, and garlic (if using fresh). For DIY lentils: Rinse lentils in water, cover in 2 cups water, bring to a boil. Let simmer for ~18 minutes then drain. 1. Warm olive oil in medium to large pan / skillet. Once warm, add onion, garlic, and bell pepper. Sauté for 4-5 minutes, stirring frequently, or until the peppers and onions are tender and slightly browned. 2. Add spices and mix to coat evenly. Add the sugar, tomato sauce, and worcestershire sauce (optional). Mix well again. 3. Add the canned / cooked lentils and simmer mixture on low-medium for 5-10 min. 4. Taste and adjust flavour as desired, including salt and pepper. If desired, toast your buns before ‘dressing’. Slather bun with your chosen sauce and add toppings to dress it up – fresh red onion and tomato work beautifully. Leftover lentil mix works well with quinoa. Assumes 5 servings with one whole wheat bun each. Based on canned lentils. Thanks to supernanny Paula for teaming up to create (and make!) this recipe. Thanks to FreshPrep for the original inspiration. This recipe is adapted from Minimalist Baker and Nora Cooks.